As an alternative to quartz sand, olivine can be used as an abrasive because it is softer, which reduces the potential for chipping, cracking and other surface blemishes and leaves a cut edge that is polished to a smooth finish. Because water jet cutting does not vibrate the glass, there is no heat-affected zones (HAZ), or leave behind rough edges, almost no secondary finishing is required. 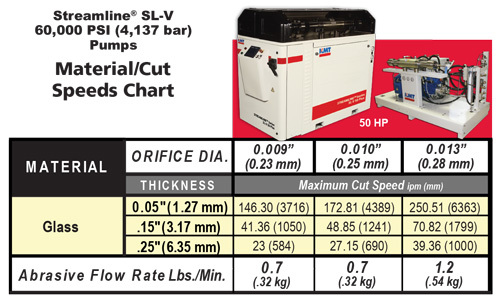 These cut speeds result in a very smooth, burr-free edge that require no second operation finish.